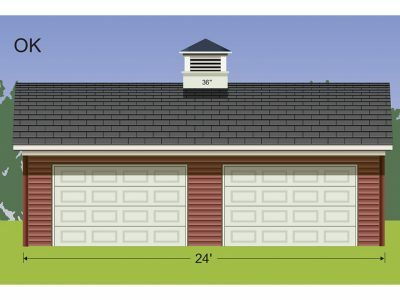 What is the Properly Sized Cupola for My Building? All of us have seen it; an old barn with something on the roof that seems to “top off” the whole building. Literally. It’s called a cupola. 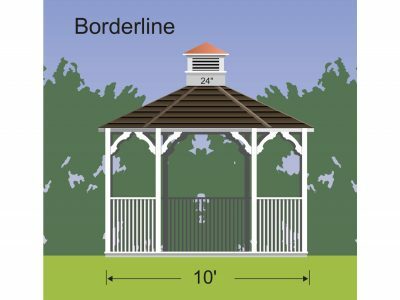 Now you’d like to add a properly sized cupola to your storage shed, garage, or even your house (See our blog “How to Increase Your Property Value with Beautiful Cupola Designs). A properly sized cupola has more planning behind it than you may think. If it’s small, it doesn’t look right. If it’s large it takes away from the symmetry of your building. 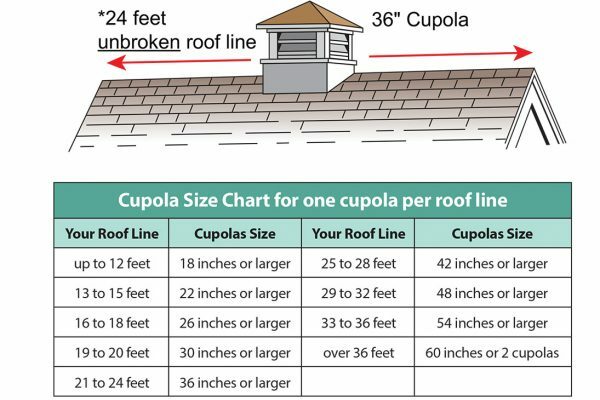 A good rule of thumb is for every foot of building width you should have at least 1.25 inches of cupola. 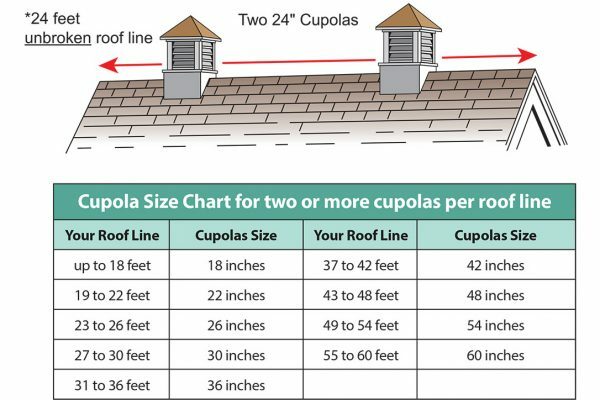 This means if your building is 12 feet wide your cupola should be at least 15 inches wide. (1.25×12=15). One blog post says with a touch of sarcasm that this formula was created by someone who wanted to sell you a bigger cupola. Just remember your cupola will look much smaller on the roof than it does out of the box (See the next point). In my opinion, it’s better to err on the side of a larger cupola but it’s a free country! One mistake is choosing a size from the ground without realizing that once the cupola is in place on the roof, it will appear much smaller. Consider placing a cardboard box the expected size of your cupola on the roof, then step back to see how it looks. 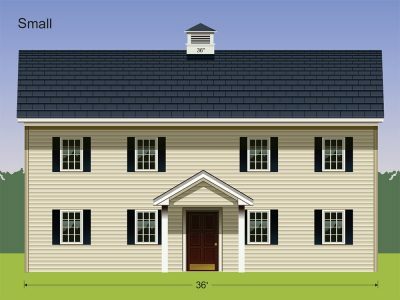 Perhaps you have a long building and want to visualize how it would look with more than one cupola. www.hansenpolebuildings.com has a few ideas for determining whether to put one or more properly sized cupolas on your roof. 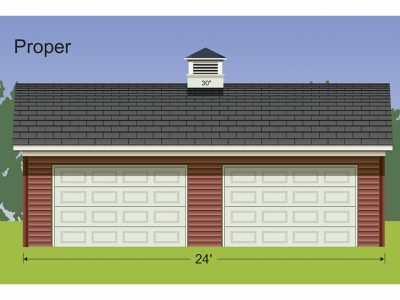 How High Should I Size My Cupola? Generally, you don’t need to agonize over the height of your cupola. Cupolas height is sized in proportion to its base. Let your cupola building expert worry about the height of your cupola. 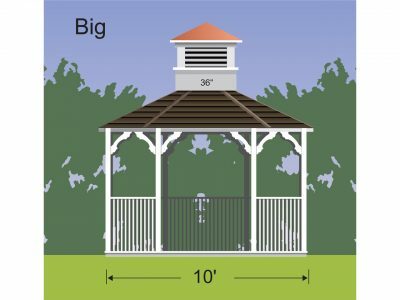 Any more questions on how to properly size your cupola? Feel free to contact us!